Had a chance to be downtown last weekend on the 13th floor of a building and snapped a few shots overlooking the Georgia Aquarium and Centennial Park. 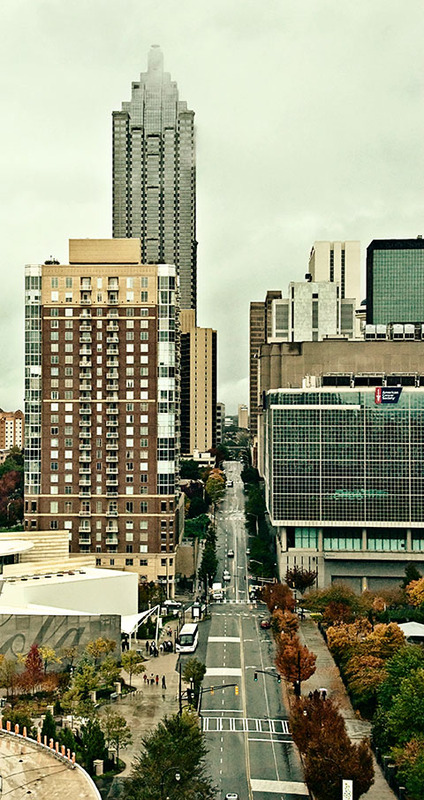 This view shows Baker Street as it makes its way up the hill to Peachtree Street. As you can see, it was a drizzly day, so I gave the very gray original image this retro, almost old-Ektachrome sort of look. Not even sure I like it, but tired of playing with it and decided to post it anyway. What a frightening mix of architecture—I guess it does not read this way from ground level. The faded Ekta suits it well!